Discussion in 'Scripting' started by liliactr, Apr 16, 2014. I need a batch file that will convert install.esd to install.wim or vice versa. Forexample install.esd has 4 indexes, batch will convert it to editable install.wim with 4 indexes or vice versa. It is very problematic to apply an esd to a folder and export to a wim file again (most difficult part is delete that folder again). murphy78 has a great batch smiler to it but it needs to be edited for my aim. It creates a vhd drive, applies to it, creates wim from it and deletes vhd drive. here is his batch if he gives permissions. echo To do so, 'Open Command Prompt as administrator' in the current directory. echo then change location to the script directory. echo Incorrect Usage or filename. for /f "tokens=1* delims=: " %%i in ('dism /english /get-wiminfo /wimfile:%1 /index:4 ^| find /i "Name"') do set WINDOWSNAME="%%j"
ECHO There is a problem reading the index name. ECHO There is a problem reading the index architecture. ECHO There is a problem reading the index edition id. ECHO There is a problem reading the index language id. choice /c 1234q /n /m "Choose a menu option, or Q to quit: "
ECHO. An install.esd file is already present in the current folder. ECHO. An install.wim file is already present in the current folder. Echo Applying ESD Index 4 to a VHD for re-capture. ECHO Capturing the applied image back to a new install.wim. Echo Applying ESD Index 2 to a VHD for re-capture. ECHO Capturing the applied image back to a new boot.wim. 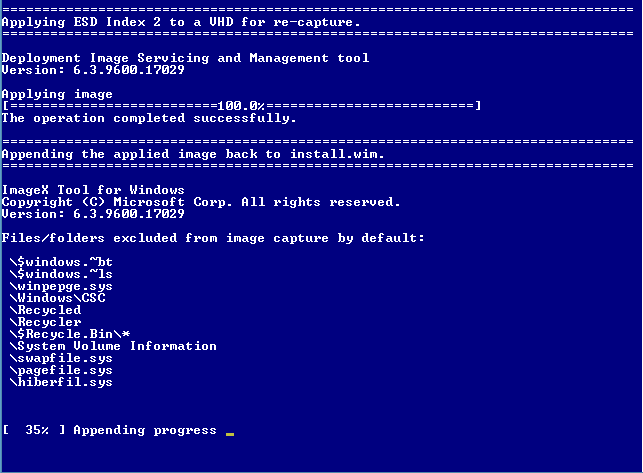 imagex /capture /flags "9" /check /compress maximum Z:\ ISOFOLDER\sources\boot.wim "Microsoft Windows PE (%arch%)" "Microsoft Windows PE (%arch%)"
Echo Applying ESD Index 3 to a VHD for re-capture. ECHO Appending the applied image back to boot.wim. imagex /append /flags "2" /check /boot Z:\ ISOFOLDER\sources\boot.wim "Microsoft Windows Setup (%arch%)" "Microsoft Windows Setup (%arch%)"
ECHO. There is a problem Creating a VHD to work with. ECHO. PRESS ANY KEY TO EXIT. Only WIM > ESD possible . I do not want to work on microsoft encypted esd. i want to convert user created esd <> wim. i do not want to create iso also. esd to wim is also possible. new dism can apply an esd to a folder. thats why vhd routines. my batch also should have vhd routines. Maybe when executed inside a folder it can looks for a install.esd or install.wim. If it find and install.esd it convert it to install.wim. If it find install.wim it can convert it to install.esd with. There's no official method to convert esd to wim. We use vhd and apply/capture techniques for the esd iso script. You're welcome to look at the script for yourself, but be warned that it's actually moderately complicated to do it correctly. 9 is the number of indexes. change for your actual number. esd to wim is also possible. new dism can apply an esd to a folder. thats why vhd routines. Yeah, you can apply and recapture but not convert easily. apply and capture part is very easy with murphy78 method. i know it will take time. my problem is not with time. my problem is only with automating it. the script is ment for custom made install.esd or already decrypted ESD files. - Temporary disable AV or protection program so it doesn't interfere with the process. - Make sure the ESD file is not read-only or blocked. - Extract this pack to a folder with simple path to avoid troubles (example: C:\ESD). this method allow you to use ESD/WIM file from any location. if your machine specifications are not powerful enough, the operation will substantially paralyze your system. - If you are converting ESD to WIM, make sure there is no install.wim file present in the script's directory. during applying, you may see "[WARNING] Failed to enable short name support", you can safely ignore it. - Works on Windows XP environment and later. - Faster/Produce slightly smaller size compared to DISM. - Based on Microsoft DISM tool. - Works on Windows 7 environment and later. :: Usage 1: exportesd.bat "path/to/file/file.esd"
:: Extracts all indexes from file.esd to install.wim. 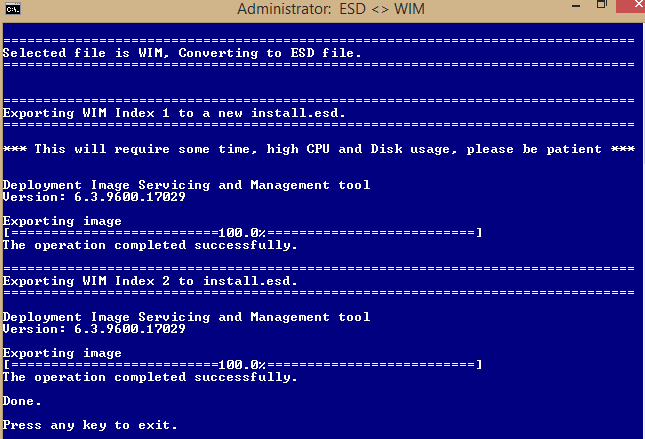 :: Extracts index # from file.esd to install.wim. :: Extracts indexes numbering from Start to Stop from file.esd to install.wim. call :errorlog "ERROR: Problem with getting name from index [%2] of [%~f1]"
dism /get-wiminfo /wimfile:"%~f1" /index:%2 > "%_tempdir%\%~n0_%rnum%.txt"
call :errorlog "WARNING: Problem with getting name from index [%2] of [%~f1]"
call :errorlog "WARNING: Problem with getting description from index [%2] of [%~f1]"
call :errorlog "ERROR: [%_tempdir%\temp_!rnum!.wim] doesn't seem to exist, aborting"
call :errorlog "ERROR: Aborted on index [%2] of [%~f1]"
call :errorlog "ERROR: Mount directory not clean, aborting"
echo Task on [%~f1] complete. :: Usage 1: converttoesd.bat "path/to/file/file.wim"
:: Extracts all indexes from file.wim to install.esd. :: Extracts indexes numbering from Start to Stop from file.wim to install.esd. dism /get-wiminfo /wimfile:"%~f1" /index:%2 >Nul && dism /export-image /sourceimagefile:"%~f1" /sourceindex:%2 /destinationimagefile:"%_tempdir%\install.esd" /checkintegrity /compress:recovery || call :errorlog "ERROR: Error exporting [%2] for [%~f1]"
What about using exclusion lists during recapture. I was playing with the ESD2WIM-WIM2ESD script, but I get an error number 13. 2014-05-01 00:14:05, Info DISM DISM Provider Store: PID=634424 TID=634572 Provider has previously been initialized. [0x80070057] ReadWriteDataInternal: (141): The parameter is incorrect. [0x80070057] ParseChunkRegionInternal: (1236): The parameter is incorrect. [0x80070057] ResNodesLoad: (951): The parameter is incorrect. 2014-05-01 00:14:11, Info DISM DISM.EXE: Image session has been closed. Reboot required=no. Maybe someone have a solution? the log is saying that it is sad, see the sad smileys? in what phase or option you get the error? There are some bugs in first version. On ESD2WIM-WIM2ESD.7z. I have not checked ESD2WIM-WIM2ESD-v2.7z yet. 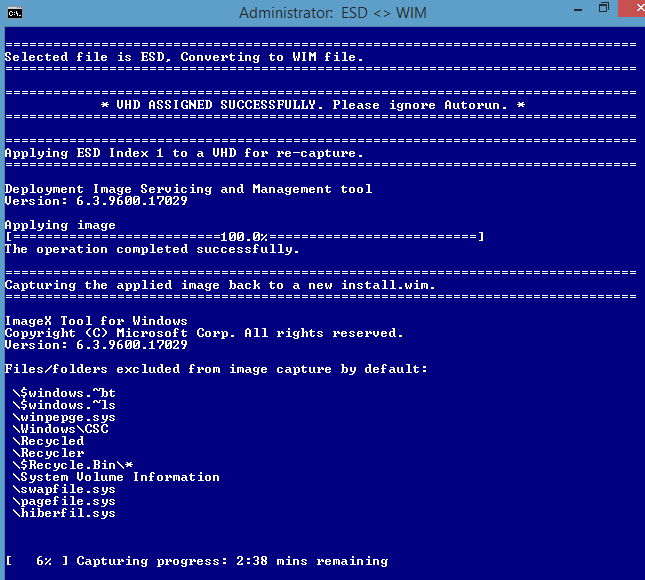 Echo Exporting WIM Index %images% to install.esd. Echo Exporting WIM Index %%i to install.esd. Also same mistake on apply and capture esd menu. I see that you removed the first script. I was using version 2. After entering the name of the file, I choose to convert all indexes. Then I get error 13 after some seconds. After trying a couple f times, I have removed everything. I have not so much time for experimenting during the week. This weekend, I will take a look of some solutions above.